On the morning of Sunday, Aug. 26, a crowd descended on Shia minority villages in Sampang, Madura in East Java. Two died in the attacks and dozens of homes were razed. Until today dozens of families remain in a make-shift shelter, while authorities have offered to “relocate” them elsewhere. The Jakarta Post’s Prodita Sabarini reports from Sidoarjo, Pamekasan and Sampang, where the Shiites were also attacked last December. The local ulema have demanded a ban on the teaching of Shia. Rumsiah stood in a tobacco field next to her burning house. She held her 3-year-old daughter tight to her chest. In front of her, the orange flames crackled as they burned the woven bamboo walls and the fire quickly ate them up. But for Rumsiah, the voices from the mushola (small mosque) speakers drowned other sounds. Rumsiah, 30, ran to the tobacco field with her children and husband as a mob of over a thousand people came to Blu’uran and Karang Gayam villages in Sampang. On Aug. 26, the day of the Lebaran Ketupat, the local Madurese custom marking the end of Ramadhan, families of the Shiite Muslims in both villages were preparing to send their children back to the Shiite Islamic boarding school (YAPI) in Bangil, East Java. But local Sunni leaders in Blu’uran stopped the rented minibus and denied them entry to the rocky roads of the village, Ummu Kulsum, wife of imprisoned Shiite leader Tajul Muluk said. 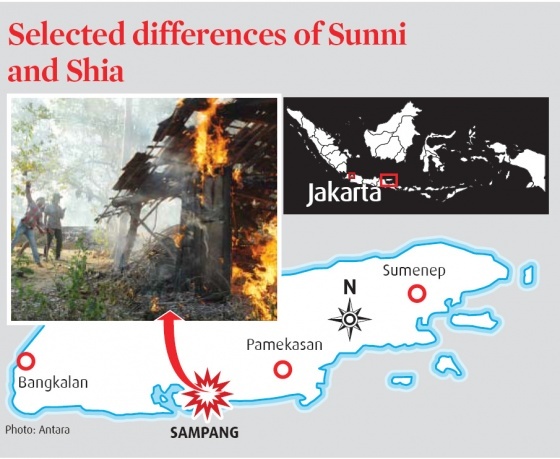 Tension between Sunnis and Shiites has been high since the ulema in Sampang declared the Shiites, led by Tajul in Sampang, a deviant Islamic sect. Last December, a mob burnt down three houses, including Tajul’s. Not long after, Tajul was sentenced to two years in prison for blasphemy. “Come if you dare!” shrieked an incensed Shiite at his neighbors who had advanced toward their house. As the mob approached, Molotov cocktails were thrown exploded. “They [the Shiites] were prepared to fight,” Noer Tjahja, the Sampang regent said. Blu’uran and Karang Gayam now have patches of charred ruins where houses used to stand. Chickens peck aimlessly around what was once a rice mill, and rifle-slinging Brimob officers stand guard. Too little, too late. The mob razed 37 houses of Shia followers. Mohammad Khosim, or Hamama, 50, died in a carok (duel); hacked to death by Husein, 48, from the Sunni crowd, who later died himself in hospital from machete wounds. Hamama’s brother, Thohir, 46, a Shiite, is still in a critical condition. Some eight people were injured, including the Omben precinct police chief. A woman in an ochre prayer dress sits alone on the carpet of the Sampang indoor tennis court. She faces Mecca. Behind her, children chase a ball or dance to the blaring songs played by volunteers from Tagana (the Social Affairs Ministry’s Disaster Response Team). The tennis court has become a makeshift refugee camp. On her right a large banner separates two sides of the court. Over the separator are rolled mattresses, pillows and the personal belongings of refugees. The 37 burnt houses belong to 64 families according to Kontras (the Commission for Missing Persons and Victims of Violence); around 270 people are staying at the camp. There is not much to do here. The children play with the volunteers, but the adults just sit around and wait. They would return home, if it were safe. But Noer says they can only return with the approval of the community there, when they “repent”. Tajul Muluk’s wife, Ummu Kulsum and his brother Iklil have become leaders of the refugees. Kulsum carries a calm maternal air with her, silently enraged by what she calls Sampang regency’s “incompetence”. “If the regency could handle these differences properly, it would not be like this. They protect the guilty instead of the innocent. My husband is innocent and he is in prison,” she says flatly. Most of the faces in the mob were strangers to Kulsum, but she could name her neighbors as leaders of the mob. Yet police have arrested only Tajul’s brother and arch-enemy Roisul Hukamah as the sole suspect. Kulsum said she did not see Rois, as he is popularly known, at the scene. But it was Rois, an official said, who summoned the people using text messages and phone calls. The Sunnis believed that the new leader of the Muslim nation after the death of the Prophet Muhammad was Muhammad’s close aide, Abu Bakr, who was appointed by the Prophet to become the first Caliph of the Islamic nation. Meanwhile, the Shiites believe that the leadership remained within Muhammad’s family tree, which means that the Prophet’s cousin and son-in-law, Ali ibn Abu Talib, should be the leader instead. While the Sunnis accepted that the first four Caliphs, Abu Bakr, Uthman ibn Affan, Umar ibn Al Khattab and Ali, were the rightful followers of Muhammad, they are not considered infallible. Shiites, meanwhile, believe that imams were the descendants of the Prophet. Shiites often worship the imams as saints and perform pilgrimages to their tombs and temples to seek blessings. Shiites allegedly resented some of the companions of the Prophet Muhammad, such as Abu Bakr and Umar, who narrated the Prophet’s life and spiritual practices, and thus did not base religious practices on the testimony of those individuals. The Shiites supposedly allow the nikah mut‘ah, or fixed-term temporary marriage, which is not tolerable within the Sunni community believing it as planned and agreed fornication. When leveling their heads to the ground during prayers, Shiites place their forehead onto a piece of naturally occurring material, often a clay tablet said to be from Karbala, Iraq, the place where the son of Ali, Hussein ibn Ali (d. 680) was martyred, instead of directly onto a prayer rug. In addition, some Shiites perform their prayers back to back, sometimes worshipping two times consecutively and thus praying five times a day but with a very small break in between the prayers.